As a ship floats on seawater, the danger of flooding is always there. The unwanted ingress of sea water in large quantities can result from a variety of reasons, and certain steps must be taken immediately in the occurence of such an event. The following sections describe the actions to be taken in this situation both by the deck, and engine room crew and officers. The first section looks at the various reasons for a ship to take on water to such an extent that she starts to flood. There are many reasons for flooding of a ship through taking on water. This is most dangerous when water is taken on into locations that are designated dry areas such as the engine room and cargo spaces. This can result in both ships taking on water into the cargo/engine room areas; however the watertight bulkheads that nowadays should extend right up to the main deck level should give protection against overflowing between sections. The hulls of modern oil tankers are of the double skinned design to prevent pollution following a collision or grounding, but this can also prevent ingress of large quantities of seawater into the crude oil tanks. We all know of the iceberg that sank the RMS Titanic, almost 100 years ago in 1912. Water spilling from one section into another one could have been prevented if, the watertight bulkheads had extended right up to the main deck level. Many years ago I was sailing as Fourth Engineer on the MV Fair Head; a cargo ship trading between the UK and Finland. We had rounded the Pentland Firth and a few days later ran into ice packs then sheets of ice. Fortunately, a Russian Ice-Breaker had opened a channel through the thickest ice and we followed this. We picked up the pilot who literally walked out to us, and headed into Kotka to load paper for Liverpool. As 4th Engineer one of my duties was looking after the fuel oil system that on this ship was marine diesel oil (MDO). I had been taught to check the bunker tanks for water accumulation by operating a ‘foot valve’ on the bottom of the tank. This was located in the engine room and operated by pushing the valve handle with the sole of ones shoe, the resultant outflow spilling into the bilges. On the voyage home we again encountered ice, and I had noticed a lot of water in the oil when checking the starboard bunker; letting it flow for quite a while until pure diesel was discharged out of the foot valve. I thought nothing of this (lack of experience) putting it down to condensation due to the ice. However, I did inform the Chief of an anomaly when taking the noon bunker ullages; we were gaining rather than loosing oil in the starboard diesel oil bunker! We went back down to the engine room and checked the foot valve discharge. This discharged clear water for over 20 minutes; and tasting this he it identifying it as being seawater! We were taking in water to the starboard bunker; and his suspicion that a rivet was leaking proved right after a hull inspection in a Liverpool dry dock; the ice had sheered the head of a rivet. Now, we do not use rivets any longer for attaching steel plates, but the hull steel plates can spring, affecting their welding. There is a lesson to be learned here for all our young Junior Engineers; sound your tanks regularly and, don’t depend on gauges alone! Not a lot we can do about becoming flooded due to a typhoon, other than battening down the hatches, changing course to avoid it and, putting the ships head into the storm and reducing engine speed can lessen the chances of flooding or indeed sinking. This is what is believed to have happened to the MV Derbyshire, an OBO carrier that disappeared with all hands in the China Seas during Typhoon Orchid in 1980. This is made up of members of engine room and deck crew members e.g. (bosun, 2 AB's and 2 greasers) also ship's officers headed up by the 1st Mate and 2nd Engineer. They hold practice emergency drills and attend courses ashore when on leave to attain certification as lifesavers. Conduct visual inspection of damage and report to command center. Check for oil pollution and act accordingly. Take all ballast, bilge and fuel tanks sounding. Check stability criteria and stress predictions for present and worst anticipated condition. Effect damage control and ensure adequate stability. Ensure cargo is intact and all water tight door and ventilators shut. In the case of engine room flooding; the level of the incoming seawater in the bilges must be controlled in order to prevent it reaching the main power generators. This would be catastrophic, leading to the loss of main power to pumps and the main engine. To prevent this bilge suctions should be opened and bilge pump activated. If this does not contain the rising water level, then the Emergency Bilge Injection Valve must be operated. 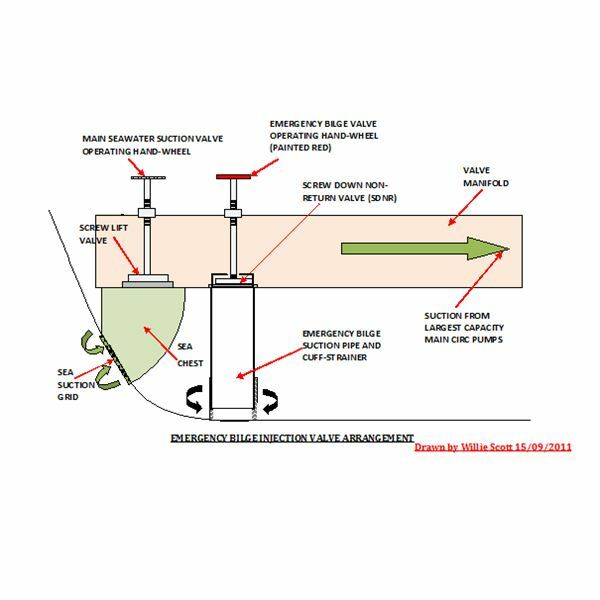 The Emergency Bilge Injection Valve must be only be used at the time of engine room flooding; being connected to the pumps having maximum lift capacity, such as the main sea water circ or ballast pump. The suction pipe below the valve is fitted above the tank top, not above the bilge well. This is because during operation, there is a higher risk of choking when the suction is above the bilge well due cotton waste etc. The operation of the valve should be checked frequently to ensure that its hand wheel can be turned freely by hand; without having to resort to the use of a wheel key/spanner. Under normal circumstances bilge water is passed through the oil water separator, before discharging overboard. However, the discharge of water from the engine room at the time of flooding is pumped directly overboard; by-passing the oil water separator. In this situation the Port Authorities should be notified. A diagram of a typical arrangement of a typical emergency bilge injection valve is shown below; please click on image to enlarge. Emergency response plan is important onboard the ship as this gives the duties and responsibility to be performed by crew members during the emergency situations on board. This series will give you the idea of different types of emergency situation on board the ship. Marine engine room flooding: Causes, safety arrangements & course of actions.